Suite, l'océan, avec coin cuisine, balcon. 2 Queen Bed, cuisinière électrique, micro-ondes, cafetière, vaisselle, TV Plasma, Air cond. La suite est simple joyeuse et moderne, il dispose de 2 lits queen, micro-ondes, cafetière, vaisselle, TV, climatisation. Si vous regardez par la fenêtre, vous pouvez voir la piscine et la beauté de l'océan à quelques mètres !! Il ya aussi un restaurant avec service de chambre et deux dépanneurs. Le changement de service de ménage et la feuille est une fois tous les trois jours. Il ya aussi des serviettes disponibles pour la plage gratuitement. 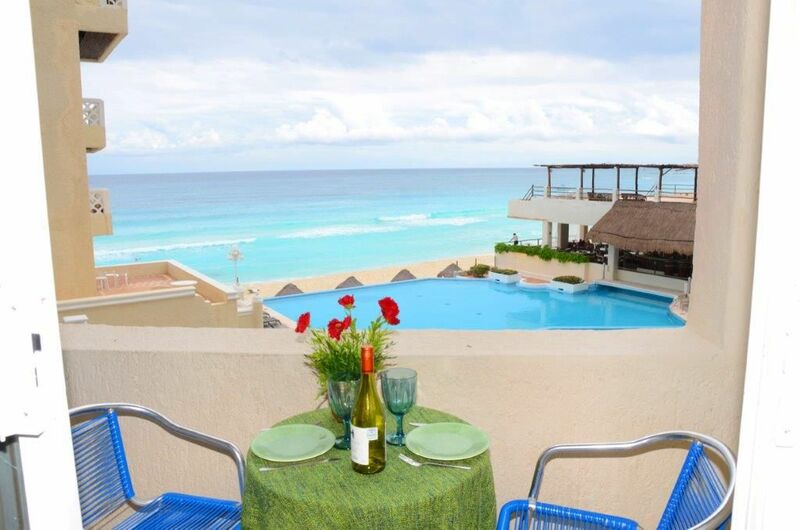 La suite est dans la zone hôtelière de Cancun zona de l'adresse est KM20 kukulcan blvd, Cancun Plaza. L'emplacement est le meilleur que vous avez à l'entrée des arrêts condos de bus qui peuvent vous emmener à trois centres commerciaux (Plaza Kukulcan, La isla et caracol) en moins de dix minutes et peut aussi vous emmener aux ferrys qui laissent à Isla Mujeres, el Garrafon centaines de restaurants, terrains de golf, excursions dans la jungle et d'autres endroits mémorables comme Cocobongo, Daddy O, The City, et Senor Frogs. Ce même bus peut vous emmener à Parque de las palapas, Mercado 28 et le centre de Cancun en moins de 40 minutes. Demandez à la réception pour les visites aux poulet Itza Ruins, parcs aquatiques comme Xelha, Xcaret, cenotes entre autres. Ou tout simplement faire une promenade sur la plage, bronzer sur la piscine, ou aller nager dans cet océan bleu étonnant profiter Cancun !! La suite est prêt à donner un accueil chaleureux à ceux-ci comme de merveilleuses vacances, détente, de plaisir ou d'aventure, profitez-en! This was a nice studio. Kitchen equipment, towels and soup etc supplied. Cleaning every three days was super! Only draw back is the poor internet connection! The view from the room is AMAZING! Hi , We are glad to hear that you had a good time at our suite, Sorry about the internet connection , it is nearly imposible to have a good one in Cancun's Hotel Zone , no matter that we are working hard to improve it. This place was very nice. Everyone was friendly and I felt safe the entire time. It was located on the quiet side of the hotel zone so it had a very calm and relaxing atmosphere. The pool was beautiful and the view from the pool to the beach was amazing! The beach was beautiful also, I never had trouble finding an available palapa. The only complaint about the beach was that there was a lot of seaweed but other than that it was clean and calm in the mornings. Transportation up and down the hotel zone strip was very easy by taking a bus that only charges 12 pesos which is less than a dollar. The store on premises had pretty much all I needed and at reasonable prices so I never felt the need to actually take a trip to the supermarket. There is also an OXXO which is kind of like a 7 Eleven which was very convenient and across the street there is a seafood restaurant that was super delicious. The reason why I don’t give it 5 stars is because the toilet seat pinched every time I sat down, the beds were very hard so it was difficult to get a good night’s sleep. I also think that a blow dryer would have been a plus and maybe a dish towel for the sink in the room. Another thing is that we visited the restaurant on premises a few times and each time the dish we ordered was not available. Martin’s apartment is nice with beautiful ocean view. I stayed there for a week and found the location to be very convenient and easy to find. No need for taxi as local busses R1 & R2 stops right in front of the hotel. I never had to wait more than a minute to catch a bus 12 pesos or 1 dollar. There is a convinient store with plenty of beers and items that you might need. Restaurant on the hotel premise is very well also. I am vegitarian but I found the restaurant to be very accommodating to my needs. I will surely stay here again if I am ever in Cancun. There is oxxo store and 19.5km restaurant in walking distance. We also got food delivered to our door from surfin burrito on multiple nights after our tours and long days. Place was very clean with house keeping cleaning the place every day. Balcony was a plus where I spent good amount of time relaxing and enjoying drinks with ocean view even at night. Don’t hesitate to book this place. A great place to stay if you are just wanting to get away. —owner is quick to respond and answer any of your questions. —believe the reviews that say, “the walls are thin”. You hear everything next door and they hear everything you say/do. Our expectations were low. We wanted a good view and a clean place to lay our heads at night. This place delivered and so we were not disappointed. We loved our experience here! The facility is great overall. There's an office where you can get new beach towels every day and the people in there are great with helping you book excursions, answering any questions you may have, and calling you a taxi. The restaurant and bar on site is very good and affordable.There is housekeeping. Buses for only 12 pesos come right by the place every couple of minutes and they'll take you into town. The location is great because it is a little bit south of much of the traffic, only about 15 minutes from the airport, and has great restaurants within walking distance. Beach isn't crowded and the pool is very nice. Staff is nice and willing to work with you. We got our refundable deposit back quickly and without having to do anything. I definitely want to go back and recommend this place! Everything as advertised except the beds were doubles not queens. Problem quickly solved by purchasing an air mattress from the supermarket. Onsite restaurant was fairly cheap and local’s restaurant across the road has fantastic fish tacos and guacamole. Easy to catch the bus into town. Pool and beach were excellent and not crowded. Belle vue face à l'océan avec accès direct à la plage. Juste en face de la propriété est une ligne de bus qui relie des commerces, des restaurants et la vie nocturne.